I've had my eye on this cute calendar for awhile and was crushed when I saw it was sold out in a matter of weeks on riflepaperco.com. I can't tell you how happy I was when I did a quick google search and found it available on a couple of other sites. I ended up purchasing it on through anthropologie because they were having a deal on shipping. 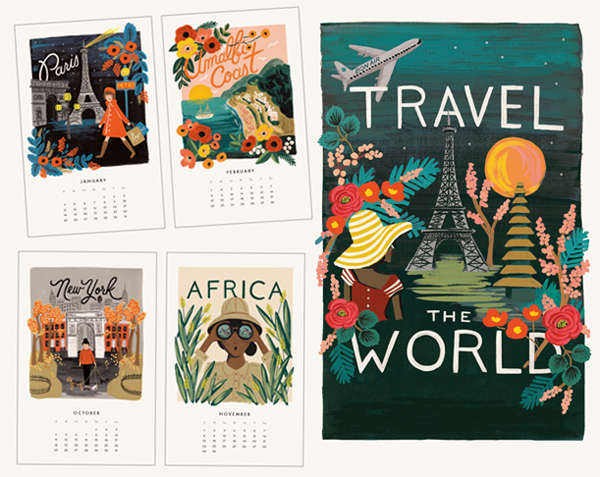 I'd never thought that I would spend $18 on a calendar, but I've long been a virtual window shopper of Rifle Paper Co - I even follow the artist, Anna Rifle Bond, on instagram because I just love everything that she does - and I figured I would treat myself. I will say that upon its arrival I was surprised to find that it was a small desk sized calendar, totally didn't pick up on that fact when I was buying. I think what happened there is that I'd been looking the full-sized wall calendar on the original site and didn't realize that anthroplogie was only selling a desk calendar. My mistake, but I'm still happy with the purchase. Lovely artwork and I find it magical and it just makes me happy. I can't wait for the new year to start so that I can display it. If you're ever in the market for a cute calendar, planner, stationery - you name it, I would definitely recommend checking out riflepaperco.com.